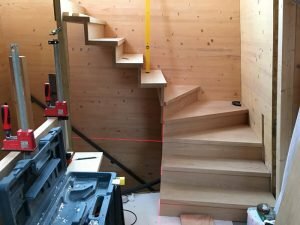 This floating oak staircase is just the sort of bespoke joinery project we love; a challenging brief requiring a very particular solution. Our client needed the stair to provide access to a new rooftop extension. 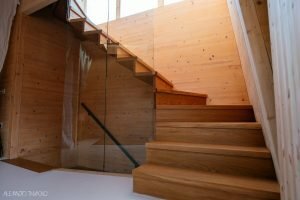 The project was for an award winning contemporary timber house; it had to match the style of the existing staircase and fit into a tricky asymmetrical space with sloping walls and not many right angles. 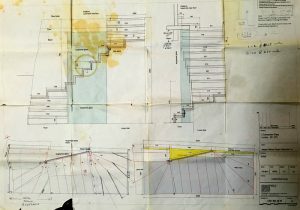 Our client had basic drawings from their architect but no construction details. 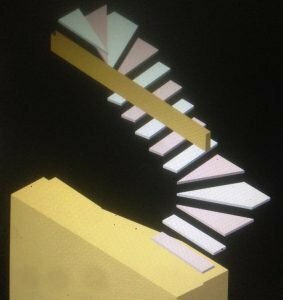 We started by building a 3D CAD model from our own survey of the space, to understand how the staircase would fit and how best to build it. We quickly realised that because of the shape of the space, each tread would have to be made to an individual template and installed one at a time. In our workshop, all 30 stair components were machined and prepared from premium grade european oak. 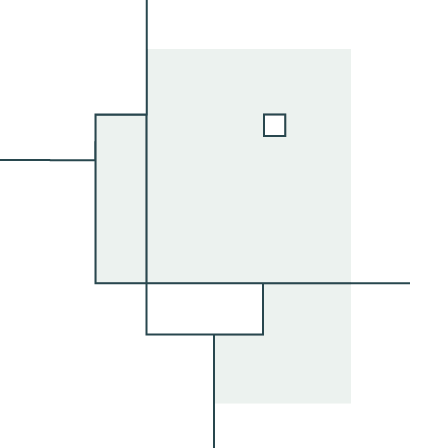 The pieces were made over-sized so that we could trim them each one to fit exactly in its’ place. 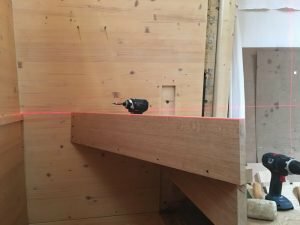 Each stair tread was laser aligned, jointed to its’ preceding piece and fixed to the timber walls with dowels. The stair had to be supported during construction; only supporting itself once the final piece was fixed in place. After installation, the floating staircase was sanded and then oiled to match the rest of the oak in the house. 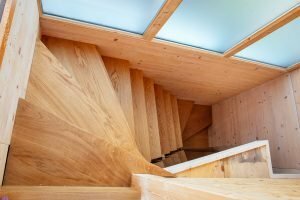 The final touch was to put in a full height toughened glass screen between the two turns in the stair, keeping the floating edge visible. Studio Loci is the trading name of The Loci Partnership Ltd.
© Copyright - The Loci Partnership Ltd.